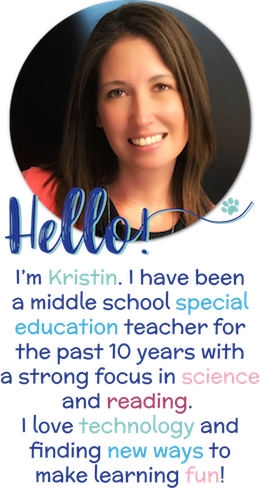 As some of you know, when I first started teaching, I got thrown into several subjects and topics that I didn’t really have any background knowledge of. One of them being Newton and his lovely laws of motion. However, throughout eleven years of teaching, thankfully with tireless research and through questioning of other scientists, I now have units that I used to loathe which are now my very favorites to teach. In case you find yourself in a similar boat, here are some ways to ignite a love for these units that can seem intimidating. When students see pictures of Isaac Newton who was born in 1643, it is hard for them to not giggle. It’s hard for them to relate to someone who was born so long ago yet I feel it is important for them to see the scientist behind the science. To accomplish this goal, I have students research about different scientists. I feel this not only helps their nonfiction reading skills but also, allows them to get to know each scientist better. The best way to engage any student is through hands-on learning. This forces them to participate, make more connections to their learning and make learning memorable. To introduce this unit, before I tackle vocabulary or anything, I introduce four inquiry activities to my students to get the wheels spinning. The activities are simple but effective. After completing the activities, we refer to them as we study different forces. Students generally remember them and have a better understanding of how forces work and interact with one another. The following day is when we tackle vocabulary. Now that students have some background knowledge based around this unit, students are likely to recall the terms more easily. Informative text gives us the background knowledge we need to tackle more hands-on learning. The text is designed to give students necessary information to better grasp the unit. 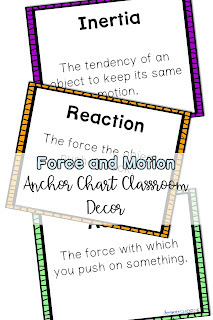 Embedded throughout the text are checkpoint and comprehension questions to assess learning and understanding of forces and Newton’s laws of motion. Technology is a focus in my district, yet I like to give students choice, so these worksheets are offered in two formats and I differentiate learning by allowing student choice. The traditional printable is included as well as a digital option which can be distributed seamlessly through Google Classroom, Schoology or your preferred learning management system. Once students have a foundation, activities are rooted to help cement learning. I do activities with each of Newton’s laws of motion which allow me to assess and further push understanding of this concept. Newton’s 1st Law: Egg demonstration. Taking two eggs (one hardboiled and one raw) we make observations and predictions to try to determine which is which once spun. Students must back up their thinking with evidence and reasoning. Then the teacher spins each egg at the same time. Students share their thinking and reasoning and then the answer is revealed. 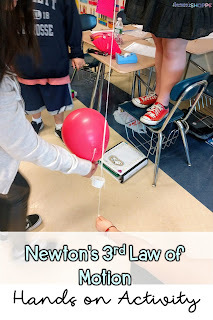 This connects to Newton’s first law of motion, “An object at rest will stay at rest and an object in motion will stay in motion unless acted upon by an unbalanced force.” In addition to the eggs, we discuss how a water bottle can also demonstrate this law. Newton’s 2nd Law: This law refers to force, mass, acceleration and their relationship. For this activity, I have my students complete word problems practicing the equation F=MA. Students complete the steps to make their balloon. The balloon’s “hot air” comes from their own breath. It is important to tell students that they cannot close the balloon as they need it open to be able to set off the balloon a few times. This activity allows students to see that as the air comes out of the bottom of the balloon, the balloon races up the straw similar to how a rocket ship is launched. STEM Project: STEM is such a hot topic lately. 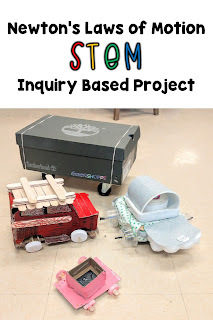 To incorporate STEM and inquiry, I have students use their knowledge of force and motion to create a vehicle that they design to hold and keep an egg safe (yes, I use a lot of eggs in my science class). 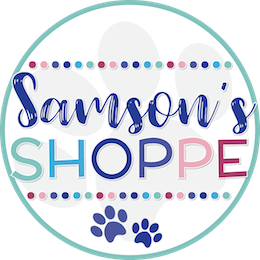 Students are given guidelines and a list of possible materials that they can “purchase” from me or I allow them to use their own materials at their own cost. The creativity that is inspired by this project is always amazing. I love test day when students come in and see how their vehicle performs. Students are able to make predictions and reflect on how their vehicle performs. The reflection piece is key as it allows me to see if students understood where their design went wrong and if they can think of modifications. To try to integrate various learning styles in my science class, I include coloring when possible. 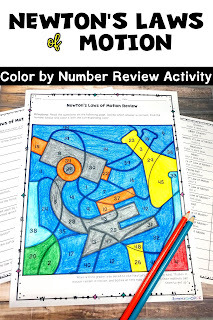 A color by number activity is a great self-checking tool that allows students to review what they learned and easily see what they know or need to review more of. 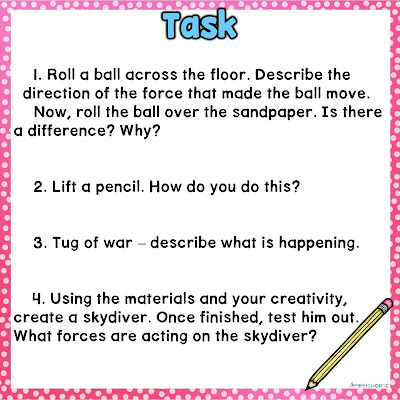 Task cards are another great review tool as I have developed ones that are printable, digital or using BOOM learning decks. This allows all modalities to be piqued and practice learning. If you are a first year or even a veteran teacher, there are units that can seem overwhelming. 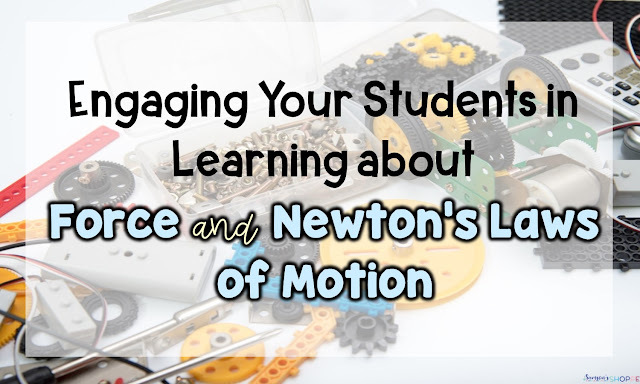 I hope that these ideas have inspired or eased your concerns about force and motion and made it seem like a unit that you can tackle and achieve great success with your students. If you have any questions, please comment below. I love hearing from you. Subscribe to my email list to get a choice homework assignment and rubric to use with your students right away. I am so glad that you joined. Now check your email for the choice homework assignment and rubric.